There are so many facets to selling on Amazon, and different parts of the process are tripwires for different folks. Remember the money line from Jerry Maguire? 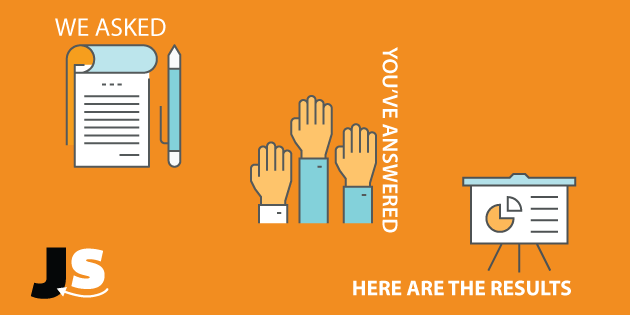 “Help me help you.” Last week I sent out a request for your help to let me know what the pain points you were experiencing with your Amazon business, and there were some great insights. First off, thank you for all those who took time to share their thoughts and experiences selling on Amazon– my heart did a little flutter at seeing the results come in so quickly! I thought that it would be interesting to share some of the results that came in. There are some great resources and groups online (like our Facebook group here), but sometimes with the nature of selling on Amazon, the experience of an Amazon seller can be a lonely endeavor. Rest assured, there are always going to be people experiencing the same challenges that you are! So let’s dig in and take a look at the results. A few caveats to start: the respondents to the survey were largely from our email list and Facebook group, so a self-selected sample in that sense. There were 2,210 total responses as of this writing. Some questions were optional, and some questions were only given to those who answered a previous question in a specific way (ie the question about how many products you are currently selling was only given to those who answered that they were active Amazon sellers). 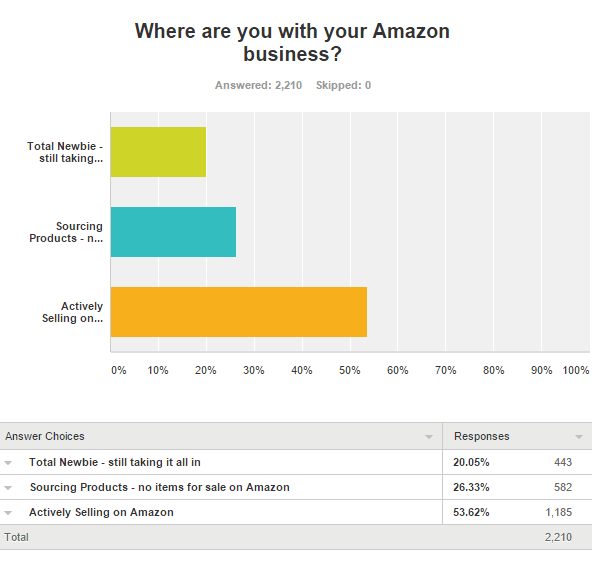 More than half of respondents are currently selling on Amazon (54%), with nearly a quarter actively sourcing a first product (26%), and the remaining 20% still in the learning phase of the Amazon FBA business model. A respondent could have answered affirmatively to several of these options. Finding a product is a challenge that half of the crowd faces. This is very interesting, as I am a strong believer that product research is the most important factor to setting yourself up for success as an Amazon seller. Unfortunately we didn’t dig in deeper here to figure out why people are having issues finding a product: margins too low, competition too high, insufficient demand, not a “brand-able” product, or any other slew of reasons. 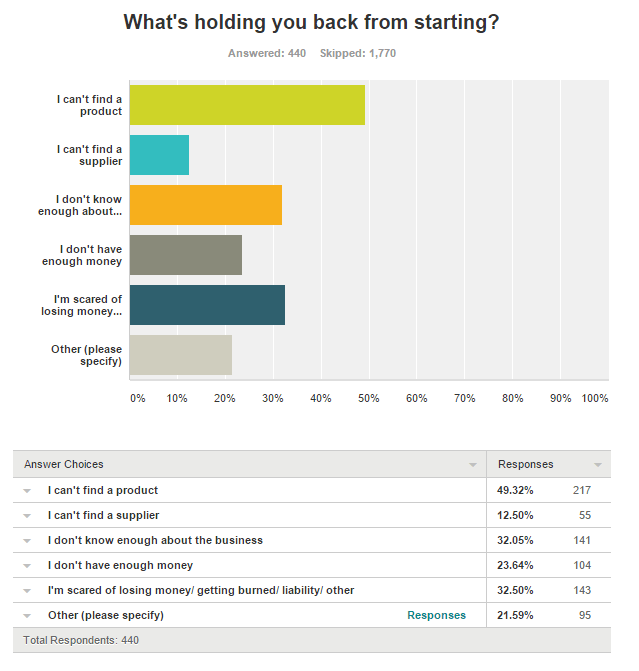 For selfish reasons, I would also want to know whether those respondents have signed up for the Web App yet….I have already heard from hundreds of users since the recent launch of the Web App that they have found numerous products in the Product Database within their first session of using the App. You can see exactly how I use the Web App to identify potential products here. So my advice to those 50% of people who still struggle to find a product is to try out the Jungle Scout Web App. With a free 7 day trial, there is plenty of time to find a laundry list of great product ideas without incurring any cost. There are about a third of the people who have not started yet because they don’t know enough about the business. This is something that I will personally address in 2016, to do my best to lay out as many of the basics as possible and lower the barrier to entry so that a knowledge gap is not a roadblock for anyone who wants to sell on Amazon. Many people noted that they just don’t know where to start. To this, I believe that once you have a general idea of the Amazon FBA business model, it is most helpful to just dive in and start brainstorming some potential product ideas. I have covered this in my launch of Jungle Stix, and will add more insights in the new year. However, part of me also encourages these people to move forward and understand that selling online will be a learning experience that they can never be fully prepared for. As they (specifically, George Patton) says, “A good plan executed now is better than a perfect plan executed next week.” Even the so-called “Experts” of ecommerce must constantly be learning to keep up with Amazon’s constantly changing algorithms, resources, Terms of Service, and tools. I know that Jungle Scout powers the product research of some very large Amazon businesses, but the volume of sellers with 51+ sellers still struck me. Assuming that these power sellers have found and replicated a working business model on Amazon, it reinforces the fact that success on Amazon is predicated on selling multiple SKUs instead of relying on just one or two. It is never a smart business decision to depend on any one channel or product, and this is just another example of that. One thing that can be especially helpful for you guys from this survey is learning what other resources exist to help Amazon sellers. Camel Camel Camel – Amazon price tracker, Amazon price history charts, price watches, and price drop alerts. Keepa – price history charts, price drop alerts, price watches, daily drops and browser addons. Google Keyword Planner – Keyword Planner is a free AdWords tool that helps you build Search Network campaigns by finding keyword ideas and estimating how they may perform. Long Tail Pro – Keyword research software to help find long tail keyword ideas. Update, October 2016 – Recent changes in Amazon’s Terms of Service addressed incentivized reviews, meaning it is no longer white hat to utilize promotions in return for honest reviews. Sellers must ensure they work hard to provide an excellent product and service that results in organic reviews. We recently relaunched Review Kick to Jump Send, focusing on email communications to help Amazon sellers grow their business. 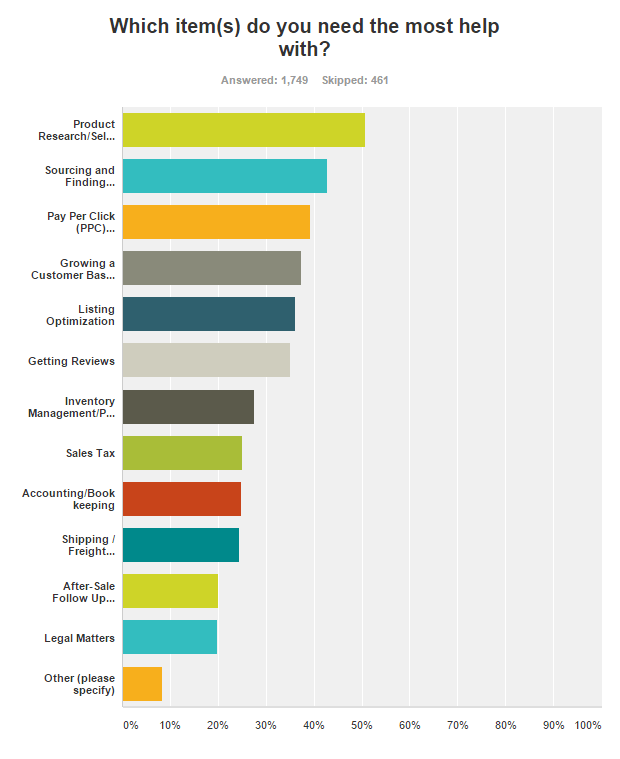 Tax Jar – Makes sales tax filing easier for online sellers and merchants. Improved Product Research: So what are we doing with these survey results? We are already busy building out some tools to make your product research experience even faster, easier, and more fruitful (hint: imagine if you could filter for different criteria and get a list of niches that fit the bill, not just products within the niche?! That would be sweet, so let’s see what we can do there….). More Educational Content: We also heard that a lot of people got value out of the Webinar series and seeing how a product is launched in real time. It has been a fun case study, for a good cause. We will still cover a webinar to update everyone on that, and cover Pay Per Click strategies and tactics. We will also really focus on the earlier stages of an Amazon business, product research, product selection, finding suppliers, etc. It seems that this would be especially valuable for a lot of you. You can register for that webinar series and catch up on past sessions here (date is still TBD). Updates on Amazon: There is a lot you are dealing with as far as being an active Amazon seller. The last thing you will want to do is pore through Amazon’s Terms of Service, or figure out some new algorithm change that they rolled out. I will do my best to pass along any relevant information that I come across that would help you. The best way to stay in the loop would be to sign up for the Jungle Scout blog here. Otherwise, please drop a line in the comments below on how we can continue to improve Jungle Scout and help you succeed as a seller on Amazon! Your findings pretty much mirror my fears and challenges I had in the beginning of my Amazon journey. Finding the right product was the biggest challenge. However with the help of your blog posts, youtube videos and research tools, product research is actually fun now and something I look forward too. I have found some amazing little treasures that way. Next challenge for me was after finding great products, not to run out of stock and how to finance it. I also want to thank you for all the info you and your team had been sharing. Great help. I have a question- I’m in the final faze of negotiation with my supplier: I want to order an express delivery to the US but after seeing the rates on the express calculator rates (various carriers) it seems the rates are quite high. They are charging 700 usd for a package: Carton Size:60*20*50cm N.W. :22.5kg G.W.:24.0kg. Might be a bit late, but I normally use http://www.worldfreightrates.com/en/freight in order to get some idea of the price. Thanks for the information Greg, this is great information. And thanks for the tips in some of the other websites you are using, I plan to check out those review sites soon.